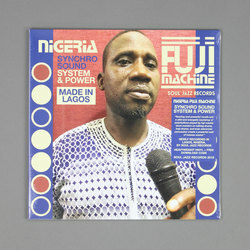 Soul Jazz Records Presents Nigeria Fuji Machine - Synchro Sound System & Power. Vinyl LP, CD. Bleep. The extended Soul Jazz team have been busy over in Lagos capturing new recordings of Nigeria Fuji Machine, the all star band featuring some of the finest Fuji style drummers and singers. Heavy! Frenzied, sharp percussion music with improv tendencies steeped in Islamic roots – if you’re unfamiliar with the style then this is probably as good a starting point as any. Though rising to popularity in the 70s, these recordings shine a light on the current climate and mark another great release in the SJ catalogue. Our personal pick is the penultimate track ‘Oro Owe’ – simply beautiful and timeless music.